Hampshire Hotel offers superior accommodation and meetings of superior standard coupled with friendly and personalised service to both business & leisure travelers alike. Total of 103 uniquely appointed non-smoking rooms with en-suite bathrooms with shower. Only 2 room-types throughout hotel, each one of our guests is a VIP! Our spacious 50 King Rooms & 53 Twin Queen Rooms are furnished with comfort beds and all necessary amenities to suite our single travelers and families alike. 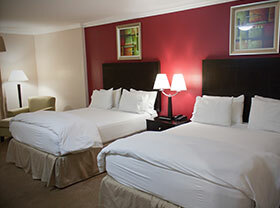 Our Double Queen Room features two comfortable Queen-size beds and plenty of room to stretch out. Its ideally suited for a family of four and provides all necessary amenities to make your trip comfortable and pleasant. 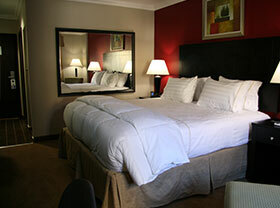 Our King Room boasts a large comfortable King-size bed and a spacious desk with ergonomic chair. With ample space to stretch out and relax among a myriad amenities, its ideal for a business traveler needing a comfortable and productive workspace. Comfort, style, convenience now within every travelers reach!